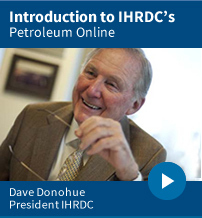 Covering today's Oil & Gas Business from upstream to downstream and from technology and operations to economics, Petroleum Online is an essential industry orientation program that is easily accessible, challenging and innovative. This e-Learning series is an ideal way to obtain a comprehensive understanding of the industry in a relatively short period of time - a "must" for anyone in today's dynamic business climate! Remember my password and automatically log me in. Copyright ©1998-2019 International Human Resources Development Corporation.